I recently came across this wonderful blog Quilt Story. This blog was created as a place where people can share the stories behind the quilts they have made. Some of the stories are truely inspitational! Every Tuesday they hold an event called Fabric Tuesday, where people can share their projects they have recently completed. The only requirement is that the project be made out of fabric. Not too difficult! So I thought I would give it a shot this week. For this bag, I used Michael Miller fabric and the Professional Tote Pattern by The Creative Thimble. It has pockets glore, which I love! 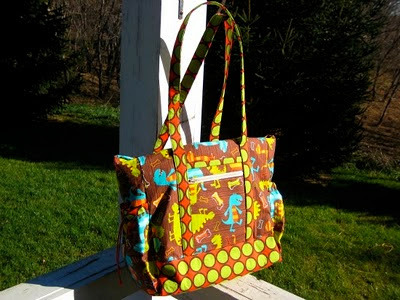 I think it took longer to cut the pattern pieces then it did to actually sew the bag together. That being said, the end prodect was worth the hard work. While the bag was originally intended for a fun computer bag, I am loving it as a diaper bag! I am linking this to my first ever Fabric Tuesday (with many more to come hopefully!). Now I can't wait to see what other people are showing today for FABRIC TUESDAY! Wow, I love the bright fabrics and I love the shape! Very nice job! Oh, i love it! Thanks so much for linking up!